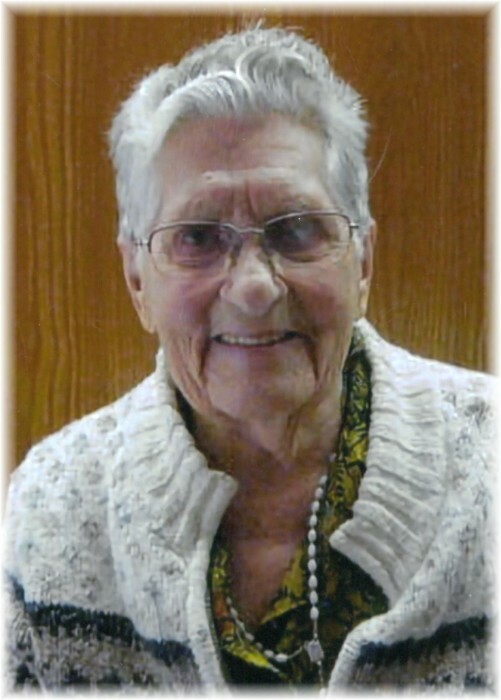 Margaret Ida Kaminski, age 96, of Dauphin Manitoba passed away peacefully on Good Friday, March 30, 2018 at the Dauphin Hospital. Margaret was born on September 5, 1921 in the Cudworth, Saskatchewan Area. Margaret was predeceased by her parents Anthony and Marie (Renneberg) Green, her first husband Andrew Weisensel, her second husband Roman Kaminski, her son Ron Weisensel and step-daughter Linda Jamieson. She was also predeceased by her brothers Clemens, Bernard, Wilf, Louis, Joe, her sister Loretta Kutcher, brothers in-law Ernie Kutcher and Bob Smith. Left to remember Margaret is her sister Virginia Smith, sisters-in-law Pauline Green and Lorette Green, daughter-in-law Rosa Weisensel, step-daughter Teresa (Peter) Smigelski and step-son in-law Bob Jamieson. Also 7 step-grandchildren, 13 great step-grandchildren; step-sons Harold Weisensel and Leo Weisensel; and numerous nieces and nephews. Margaret had a deep faith in God and was a member of St. Viator's Roman Catholic Church, never missing Mass until she was unable to continue, then attending daily Mass in St. Paul's Chapel. Her rosary was constantly with her. She was a member of the St. Viator's Catholic Women's League for 64 plus years receiving the Maple Leaf Service Pin Award in 2008. Margaret was an excellent seamstress, sewing for many people over the years and loved knitting, crocheting and gardening. Prayers were offered on Monday, April 9, 2018 at 7:00 pm from St. Viator's Roman Catholic Church in Dauphin, MB. Funeral Mass was held on Tuesday, April 10, 2018 at 10:30 am from St. Viator's Roman Catholic Church in Dauphin, MB with Father John Legitimas officiating. Interment followed in Riverside Cemetery in Dauphin, Manitoba. Pallbearers were Pam Roche, Michael Smigelski, Peter J Smigelski, Ryan Smigelski, Derek Jamieson, Richard Green. Should friends so desire, in lieu of flowers, donations in memory of Margaret may be made to St. Paul's Home or St. Viator's Parish .